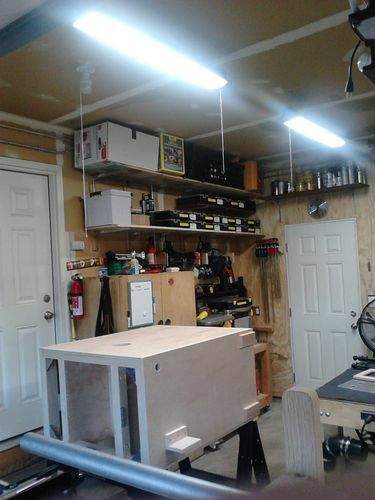 My shop is a 2 car garage (2 cars….must be fiats) and there is only (1) window and (2) over head single light sockets. It gets pretty dark in there now once the sun goes down. 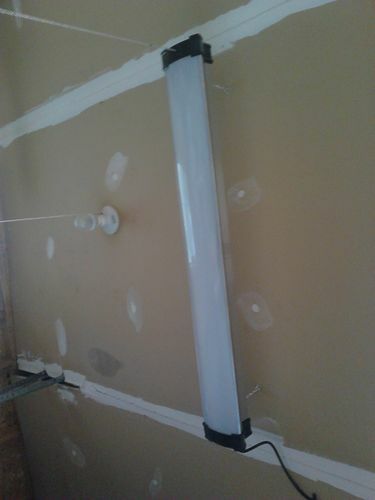 I have been planning on putting up 3 banks of 4’ fluorescent lights and running them to switches on the wall. I was researching here and various forums for advice on proper lighting and used recommended formulas. Those calculations were telling me I needed about 9-12 fixtures. That seemed like overkill. Anyway, I needed to do something now and went to the BORG and they were out of the fixtures I was planning on using. I found these 42” 4000 lumens led shop lights from Commercial Electric. The were $54 each. I was a little skeptical at first, but know I am sold. I have 4 up right now and plan for 2 more. Every inch of my work areas are now well light with pleasing clean white light. No more dark spots. Lights went up quick, no wicked glare and minimal/if no shadows. I was expecting close $65 -$70 per fixture, including bulbs, for my original plan. So far I feel like these were a better choice, at least for my shop. I think the are worth a look. sounds good.. got a link? I have to agree with this, although I only have one up so far. I bought 5 for my workshop that is in progress. In the meantime, I had to put one up in my NEW outbuilding to I could see after dark. Since they are LEDs, there is no flicker to the warm up as with fluorescents, and they are at full output right away. I was lucky as I had a %15 off coupon, so I go mine a bit cheaper. I do not have a link showing the actual light. HD’s website yet. They say the website lags behind in store inventory by a couple of weeks. Jeff, here are a couple of pics of my “in progress” shop. I also like they are good for -4 F. My shop is not heated yet. Looks great.I have fluorescent’s and even in Tucson when it gets cold you can tell they are not as bright as compared when its warmer.Nice addition to your shop. I bought 2 of these also to replace one 8’ fluorescent pair, as my 8’s burn out, I’m replacing them all with these LEDs , love ‘em! Kurt…. Can you tell me what color temperature these are?